Cliftonville have been hit by the shock resignation of manager Tommy Breslin in the wake of Saturday's 6-1 hammering at Ballymena United. The former Reds player was appointed boss in 2011 and became the club's most successful manager. Breslin guided the Solitude team to eight trophies during his reign, including two Premiership titles. Cliftonville have asked first-team coach Gerard Lyttle to take over as temporary manager. The Reds started the season in fine form by winning their opening four league games before a draw with Warrenpoint Town. Defeat to champions Crusaders in the north Belfast derby was followed by the weekend humbling at the Showgrounds, although Cliftonville played most of the game with 10 men after Peter Burke's dismissal. Despite their two recent defeat, the Reds still lie third in the Premiership standings just five points behind pacesetters Linfield. After Saturday's thumping at Ballymena, Breslin did not make himself available to talk to the media and that immediately led to suggestions that he was considering his position. Cliftonville officials are understood to have made strenuous efforts since then to convince Breslin to stay on but these ultimately proved fruitless. Breslin is believed to have met the players on Monday night to inform them of his decision. A brief Cliftonville statement said that the club was looking at ways to ensure that Breslin would maintain a role at Solitude and it is understood that he will be offered a place on the club's board. "We thank him for his magnificent contribution in taking Cliftonville FC to new heights," added the Cliftonville statement. 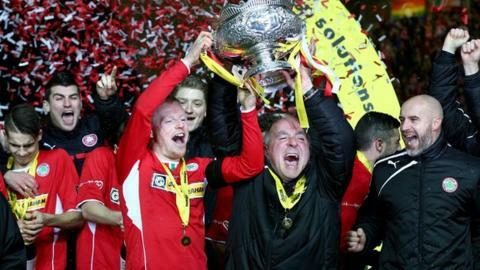 Cliftonville are chasing a fourth straight League Cup success while back-to-back Premiership triumphs came in 2013 and 2014.